Very compact, Sleek, Splash proof design Suitable to almost all chemicals Sealless pump means no contamination PP chamber makes it corrosion resistant High efficiency, High performance, Low heating Centrifugal, non self priming Pump. Chemical, Pharmaceutical & Textile Industries, Electroplating equipment, Medical equipment, Galvanizing facilities, pure water plants, Water treatment plants, Ice makers,Soft drink dispensers, Boilers, Heat exchangers, Solar systems, Dye bath, Wafer processors, Color-Black & White film processors, X - ray film processors, Metal recovery systems, Refridgeration & Chilling Units, ED Machines, etc. 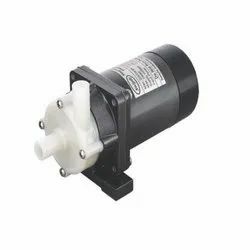 Looking for Magnetic Pump ?